With the mass balance approach users can calculate reservoir storage and outflow with satellite data. The key inputs of the dam system are precipitation and inflow. Therefore, satellite precipitation data and hydrologic models provide estimates about streamflow into the dam while neglecting its ground seepage. In the humid climates of South Asia, evaporative losses can either be ignored or estimated using standard energy-based methods. The methods are applied in many developing countries as data from global numerical weather prediction models is publicly available. The mass balance approach assumes that irrigation or domestic supply needs are met from reservoir outflows downstream of the dam. However, if extensive water is withdrawn upstream of the dam this prediction may be faulty. Nevertheless, the mass balance approach is an important tool to predict the outflow of a dam. The estimation of reservoir storage change needs two calculations. Firstly, users can evaluate the change in a reservoir storage by accessing satellite-based information about water surface area. Visible and near-infrared imagery from satellites such as Landsat and Sentinel-2 as well as sensors like the Moderate Resolution Imaging Spectroradiometer (MODIS) provide high sampling frequency for this calculation. Nam Gnouang Dam in Laos bordering Thailand and on a tributary of the Nam Theun River. Image: Eric Baran/ flickr. With the satellites’ reflectance data, open water can be detected using the normalized difference water index (NDWI). The NDWI indicates changes of water in water bodies such as reservoirs. Secondly, the area-elevation curve indicates the reservoir surface area at an indicated elevation. It can be constructed by accessing publicly available data of a digital elevation model (DEM). The data may be derived from the Shuttle Radar Topography Mission (SRTM), which collected elevation data of over 80 percent of Earth's land surfaces in 2000, or from satellite altimetry measurements of reservoir elevations. Altimetry satellites measure the time taken from a radar pulse to travel from the satellite antenna to the (reservoir) surface and back to the satellite receiver. Also the German Aerospace Center (DLR) has released the 90-metre TanDEM-X Digital Elevation Model for scientific use providing an open access global dataset of DEM. The elevation models generated with the two German satellites TanDEM-X and TerraSAR-X have been the first to capture the Earth with uniform accuracy. Through using this data, in situ measurement of the depth of a dam becomes unnecessary. Finally, the observed surface areas from satellite data are matched with their corresponding elevations. The procedure can also be carried out vice versa in order to observe the elevation from satellite altimeters. The method allows users to calculate the storage volume change of a reservoir between each satellite-derived observation. A record of average storage volume change called the “rule curve” graphically represents how a dam operates within any month. 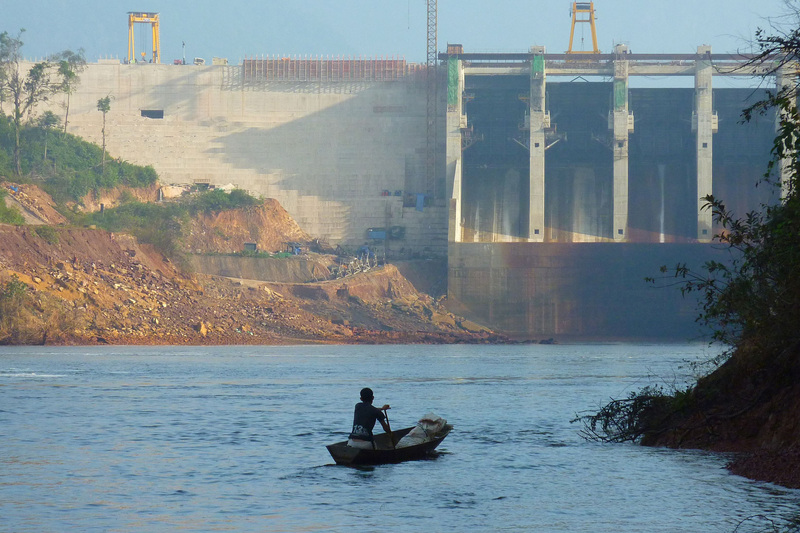 Since the operating pattern of dams are publicly available, researchers from the University of Washington and from NAWAPI tested the satellite-based technique monitoring the state of dam operations in the Mekong River basin. The satellite imagery from Landsat highlights that the water stored in the reservoir per month is constrained within the minimum and the maximum capacity of the dam, its lower- and upper bound. Cloud cover during monsoon season and limited internet access prove to be challenging for developing countries in South Asia. The researchers suggest solving the issue by using cloud-based computing services and synthetic aperture radar instruments that create high-resolution images and are mounted on air- or spacecrafts. Screenshot from the operational water forecasting system maintained by NAWAPI. 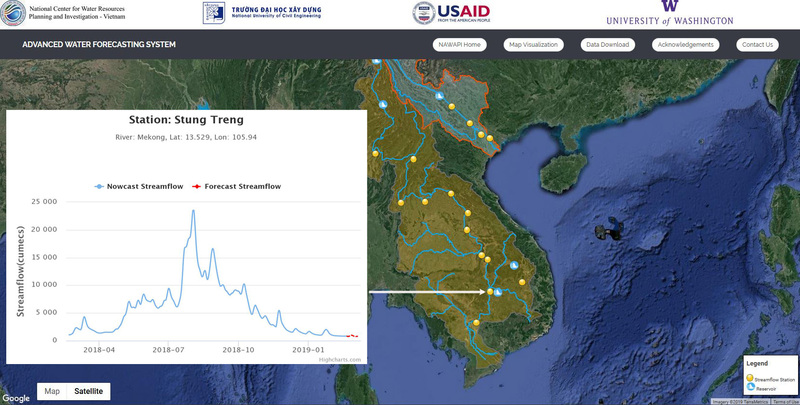 The inserted hydrograph for the Stung Treng station shows the Mekong’s streamflow for the past 10 months estimated with satellite data. Stung Treng was one of the cities hit by last year’s transboundary flood. Image: NASA. Monitoring the state of transboundary dams is essential for developing countries downstream to enhance their management strategies for disasters and ecosystem services. Numerous dams continue to be built to secure the necessary water for energy and food production, most of them by upstream developing countries with transboundary river basins. Water availability and quantity of the downstream nations depends on the decisions of upstream nations in terms of storing, withdrawing and releasing water. Although the availability of hydrologic data concerning transboundary dam operations is thus highly significant for downstream nations managing water flow, information is hard to obtain on-site. In conclusion, satellites provide the only feasible way to surveill the state of transboundary dams. Futurewise, satellite-data needs to be collected and made accessible as tools for managing water for developing countries in order to prevent last year’s disasters.